Way back in 1919 the NAACP (National Association for the Advancement of Colored People) adopted the song “Lift every voice and sing” as the Black national anthem. Since that time, the song has inspired hope and faith because despite past trials and tribulations, Black people survived and are now thriving: “The rising sun of a new day begun.” “Lift every voice and sing” has been a source of pride and solidarity for Black people for almost 100 years. In the 1960’s when the humble farm workers marched with César Chávez advocating for decent wages and working conditions, they sang De Colores. A traditional and beloved song, thought to have been brought over from Spain in the 16th century, De Colores literally means ‘of many colors’. The song celebrates the incredible beauty of life’s diversity – the multicolored birds, the radiant flowers, and the luminescent rainbow. The chorus says that just as life by its very nature is so colorful, so too great love embraces people of many colors. This song resonates with our Latino soul because we are De Colores. The many colors of humanity are right across the family dinner table. Our diversity is rooted in our mixed racial, cultural, and historical heritage. Latinos are not a race. Much like the Jewish community, Latinos are an ethnic or cultural group bound together by the Spanish language, a shared history and heritage, a revered spiritual tradition, and common values that stem from both our Spanish and indigenous roots. Latinos are a rich culture of synthesis and fusion that celebrate de colores – the radiant rainbow of humanity. Our love for diversity is also apparent in our bienvenido or welcoming spirit. And in what I call the Latino golden rule: Mi Casa es su Casa. These dynamics fashion a culture that is exquisitely diverse, inclusive, and celebrates people’s uniqueness. Furthermore since Latinos are a culture not a race and culture is leaned people can become Latino by Affinity or Corazón. This moment in history when the Latino community is coming of age is also the time when our multicultural nation and global community is rapidly emerging. Leaders must ensure that people of different races, ages, nations, sexual orientations, religions and cultures work and live peacefully together. Embracing the spirit of De Colores offers a pathway to accomplish this – to integrate our kaleidoscope society and welcome the gifts of all people. Yes! The emergence of a De Colores America will be a defining characteristic of the 21st century. Because of our inherent diversity, Latinos will be at the headwaters of this transformation. We will be a model for building the multicultural society. We can show people how celebrating De Colores – brings beauty, vitality, joy and grace to life. 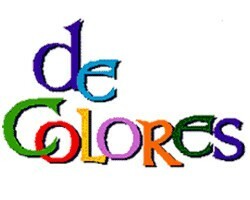 For this reason, I believe De Colores should be the Hispanic national anthem. Juana Bordas is the president of Mestiza Leadership International. She is an activist, author, and diversity aficionada.